Jupiter moves into Cancer – key dates for Cancerians & Sagittarians (July to December 2013) | QuantumPhoenix.net – Esoterica, Paganism & Ritual Magic. 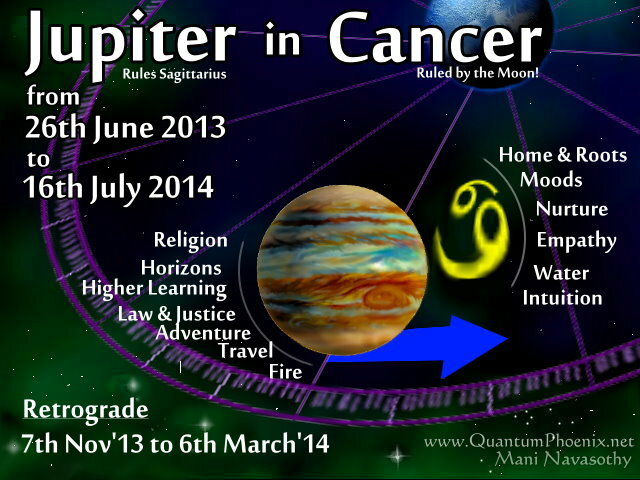 Few days ago, Jupiter moved into to the sign of Cancer! This is great news for Cancerians, and marks a major shift in energy for all Sagittarians (who are ruled by Jupiter). Cancerians are about to get the full benefits of all that Jupiter energies .. while Sagittarians will begin to be influenced by Cancerian qualities and traits! The graphics here shows the key dates, for when this new astrological configuration will be in place (1 year..starting from now till mid-July 2014).. and the graphics/ diagram also shows the key qualities of both influences. Religions, Distant Horizons, Higher learning, Law & Justice, Adventure, Impulse, Travel, Fire. Home & Roots, Moods & Emotions, Water, Nurture, Intuition, Empathy, Moon. This will also affect / influence everyone.. depending on which `astrological house’ position Cancer happens to be in your own natal chart. Note / Retrograde: Jupiter will be retrograding for about 5 months …between 7th November’13 to about 6th March’14.. during which time, new progress in these areas may be slow and limiting, but it will be opportunity for covering lost grounds, taking alternate options, reviews & consolidations.. ! Then more progress and changes will accelerate for a further 4 months (up to July’14)..
Below, I have created a 2nd graphics to show the key dates for the rest of 2013 (July to December 2013) when highly positive aspects (trines & conjunctions) take place between Jupiter and other planets, and very stressful aspects (squares, oppositions) between Jupiter & other planets. 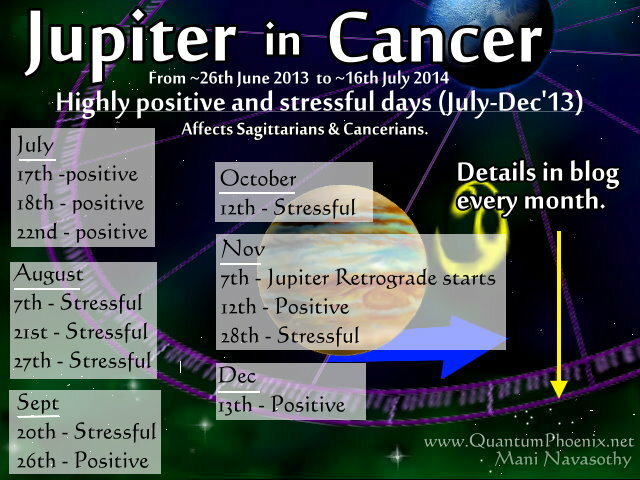 I’ll give detailed explorations of those positive & stressful aspects in my `usual’ monthly astrology forecasts.. But for now, save these graphics for quick reference. Or print and stick on your walls 🙂 (electronic or real)…and track them to make use..or navigate through forthcoming influences!